If the local spooks or school spirits got a little out of hand last homecoming or Halloween, the tree in your front yard may have more to show for it than just a little toilet paper. They may also have a bit of spray paint. 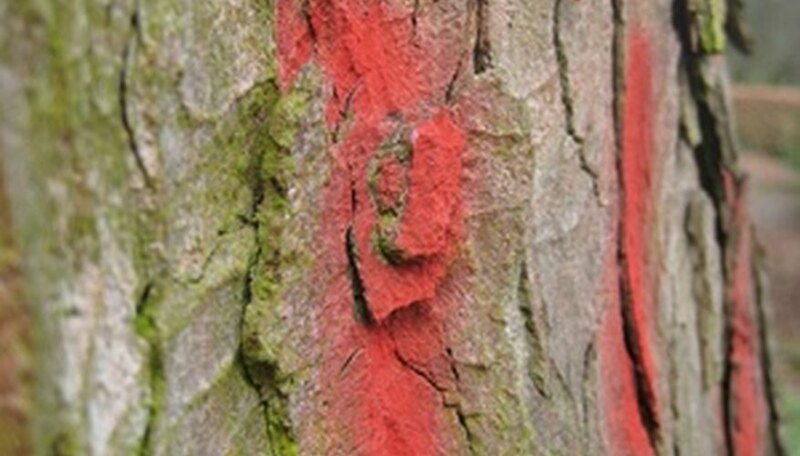 Paint on the bark will not harm the tree and will wear away over time. But until then, it will leave a long-term eyesore. Solvents can harm the tree more than the paint actually can. But you can remove paint from vandalized trees if you do so carefully. Swab mineral spirits onto the spray paint with a clean sponge. Allow the mineral spirits to sit for five to 10 minutes. Wipe the paint with a clean cloth. The mineral spirits should help dissolve the paint so it can be blotted away. Apply a water-based, biodegradable solvent to the tree. Spray the solvent onto the affected area. Wait three minutes for the solvent to dissolve the paint. Wipe the solvent away with a clean sponge. Brush at the bark with a scraper or a copper-wire brush to loosen and remove the layer of paint and surface bark without removing the bark completely. According to the United States Forest Service, you can remove paint from trees with a power washer and sand blaster. Machines such as this are available for rent from many home improvement or heavy equipment stores.